It is being likened to the great migration of wildebeest in Africa. Scientists have discovered that Australia’s extinct diprotodon would also make long annual treks across the continent in search of food. The animal, which was a kind of giant wombat, left tell-tale chemical clues to its behaviour in its teeth. Research led by the University of Queensland, suggests that the creature would make regular round-trip journeys of up to 200km. “It goes back to that old saying ‘you are what you eat’, because the chemicals of the food they consumed became part of their teeth. But it’s also true that ‘you are where you ate’, especially if you are a plant-eater, because the geochemistry of the soils where plants grow also become fixed into a herbivore’s tooth,” explained Dr Gilbert Price. The marsupial, which stood about 1.8m tall at the shoulder, disappeared just over 40,000 years ago, probably as a response to human hunting pressure and climate change. Dr Price said no modern marsupial makes an annual migration, although kangaroos will cover large distances on a nomadic basis. More than a million wildebeest, zebra and antelope make an annual round-trip through the Serengeti-Masai Mara ecosystem that straddles Kenya and Tanzania, to take advantage of the best feeding grounds. Dr Price said this extinction event could provide some lessons about other migratory beasts. “What are the implications of losing a major migratory animal like a zebra or wildebeest?” he asked. 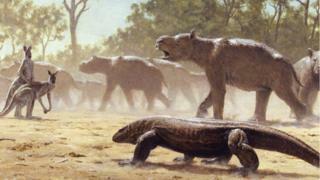 “Diprotodon was also a big herbivore that would have been capable of eating you out of house and home. “How does taking an animal like that out of the ecosystem impact the vegetation and the numbers and predatory order of other animals? The teeth study is reported in the Royal Society journal Proceedings B.